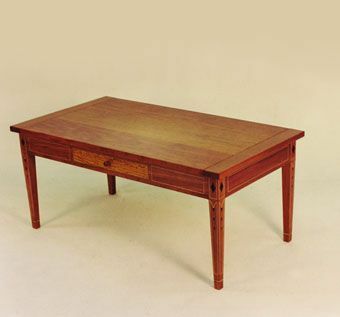 This coffee table is another example of a client that allowed me to use my artistic license. On the top you will see breadboard ends that help keep the top flat. The drawer is veneered with satinwood and for those who may wonder the drawer is dovetailed. The legs are tappered with a maple inlay and ebony diamonds. Going down the legs are upside down triangles that get smaller as the leg tappers.